The bathroom is one of the rooms in your home where good task lighting is really essential. The bathroom is where we get ready to face the day as well as prepare for a restful night. It might even be the place where we seek sanctuary from the demands of our everyday life, soaking in a bath or treating ourselves to an at-home manicure. A lot of what goes on in the bathroom involves your mirror, including applying makeup, washing your face, shaving, and so many other personal grooming tasks. All of those tasks should have the right lighting so you can get them done correctly. Without the right lighting, you never know what you might look like when you step outside the bathroom and into the real world. When it comes to task lighting in the bathroom, the best placement for your lighting is directly next to the mirror and in front of you. A pendant light in the bathroom is only going to provide downlight, and if it’s placed in the back of you it could create shadows on the mirror and hinder your ability to see yourself clearly in the mirror. That’s why placing the lights in front of you and to the side of the mirror is the best option and why so many homes have sconces next to the bathroom mirror. However, over the last decade lighted mirrors have come back into style and are replacing bathroom wall sconces. We love lighted mirrors; they provide a modern, clean look for your bathroom lighting and provide you with great task lighting to get all of your personal chores done. 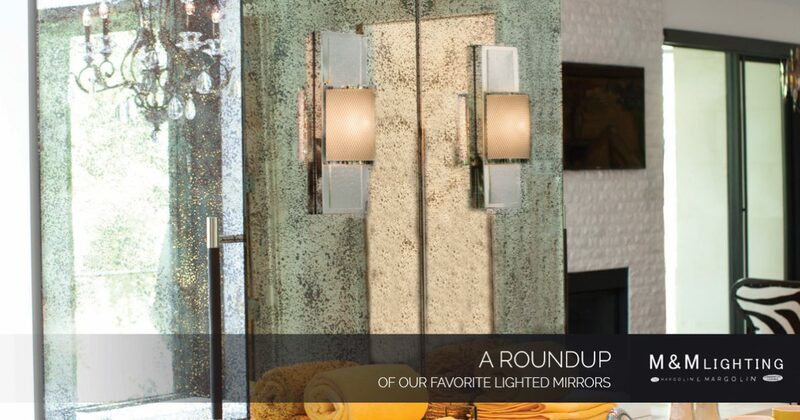 We sell a great selection of lighted mirrors in our lighting showroom in Houston. Here are some of our favorites! If you want a big, beautiful mirror that will complement your modern decor, this LED mirror is the answer. At just over four feet across, this mirror will fill up your space and give you plenty of room to admire yourself from every angle. The light bar across the top of the mirror provides beautiful clear lighting to wash away shadows and give you a clear view. The bulbs are included with the purchase, too, so you’ll have everything you need to get your new lighted mirror hung up and ready to use. If you love the idea of an LED mirror but are looking for something a little smaller, check out this LED mirror. At just over 30 inches high and 23.5 inches wide, this rectangular mirror is ideally suited for most bathrooms. The LED lighting strip runs all the way around the mirror, covering all four sides and giving you an even light no matter which way you turn. This oval mirror will make you feel glamorous even when you’ve just rolled out of bed! With nine bulbs, the light runs all the way around the perimeter of the mirror and casts a beautiful light on your face and throughout the bathroom. You can even pair this mirror with a dimmer switch and use it as a nightlight for the younger members of your household. Want to bring some elegance and drama to your bathroom light? This is the mirror for you. This mirror is adorned with hand-cut crystals on top of its silver finish, giving it plenty of sparkle and shine. Two sconces flank the sides of the mirror and use candelabra bulbs to give the illusion of candles. The light from the bulbs is reflected in the glass and the cut crystals, giving you even more shine that is sure to make you feel special every time you look in the mirror. Backlit mirrors are another great way to light your bathroom! They cast a beautiful glow that can make the room feel larger and more open, ideal for smaller bathrooms. This LED backlit mirror is paired with two light bars at the sides, giving you perfect even lighting on both sides of your face. It’s a wonderful size at three feet across and just over two feet wide, ideal for most bathroom walls. It even comes with a three-year warranty from the manufacturer so you can make this purchase with confidence! Searching for more lighting options for your bathroom? Stop by our lighting showroom in Houston. We’d love to show you our inventory of bathroom lighting, including sconces, mirrors, pendant lamps and more. Our knowledgeable team will help you find the lighting that you need to make your bathroom look it’s best and work for you! Stop by our Houston showroom or give us a call to make an appointment with one of our lighting consultants today. You can also request an appointment by filling out the form on our website!